Join Us Thursday, August 24th! Please join us with your RA’s on Move-In Night, August 24th! Fire Factor is partnering again with the New Student’s Program to offer you some safety information after you have dinner. They will have your wristbands for the Orientation on Aug 25th. We will have some hands-on activities for you to participate in regarding fire, pedestrian, bus and bicycle safety. You will learn how to live with a fire sprinkler head as your roommate. You’ll also get to learn and practice operating a fire extinguisher on live fire. UI Police will assist with signups for SafeWalks & SafeRides. If you are still looking for the perfect apartment for next year, be sure to consider fire safety. Make sure there are smoke alarms and adequate exits. 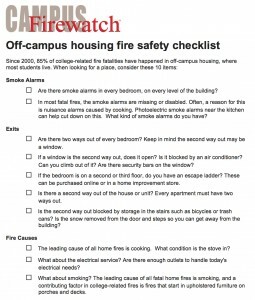 Check out Campus Firewatch’s “See It Before You Sign It” campaign, and click the image in this post for a helpful checklist.